1. The chromocenter is always closely associated with the nuclear envelope. 2. The telomeres of the X chromosome and major autosomes are positioned away from the chromocenter toward the opposite side of the nucleus, as in a Rabl orientation. 3. Each chromosome arm is confined to its own compact axial domain and there is no intertwining of arms, which explains why individual arms can be well separated in squash preparations. 4. Both arms of a particular metacentric chromosome (i.e., chromosome 2 or 3) are usually folded next to one another, and each can fold in a wide variety of configurations. 5. All arms show right-handed coiling. 6. Points of frequent contact between a chromosome and the nuclear envelope are almost exclusively at sites of intercalary heterochromatin (see Subheading 4.4.). 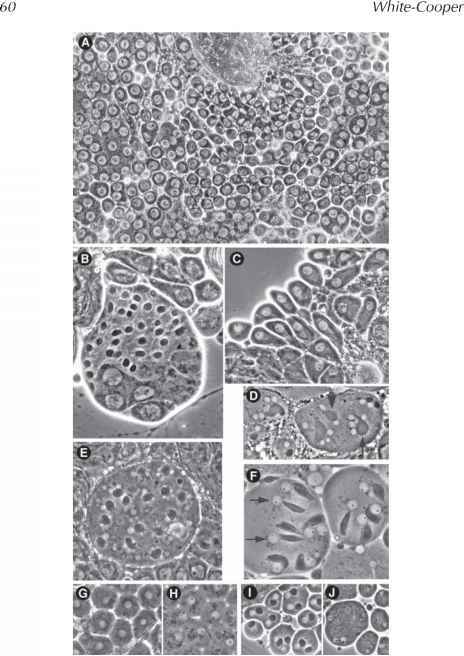 These characteristics of salivary gland chromosomes apply also to polytene chromosomes of the larval prothoracic gland (approx 256C; see ref. 159). However, the smaller chromosomes of both the midgut and hindgut show many striking departures. For example, chromosomes of larval midgut cells are rarely arranged in a polarized manner and their centromeres and telomeres can be scattered throughout the nucleus. This anomalous "organization" may stem from disruptions to nuclear structure caused by peristaltic contractions of the gut (159).